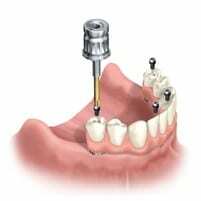 Dental implants require that a root form be surgically implanted into your jawbone. For some patients, however, they no longer have enough jawbone to adequately support the implant. When that happens, the traditional treatment has been bone grafting. To find a way around the bone grafting procedure, Dr. Palo Malo from Portugal developed the “All-on-4” technique. This method uses highly angled implants in only the anterior part of the jaw. While it may be tempting to do a procedure that is much faster than bone grafting, it is important that you know the risks. The biggest issue is that if one implant fails, the entire prosthesis will fail. There is no way to just repair the faulty parts. Because of that, you’ll want to know if there are any additional factors with this particular procedure that could lead to potential problems causing the implant to fail. There are. First, because this technique is recommended for people with low bone density, there is already a risk. It is important to have enough bone structure to support your implants. There are other risks. 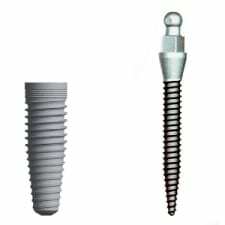 In the picture on the left are two screws that are used for fastening an overdenture to implants. The larger one is used for traditional implants, the smaller is what is used with an all-on-four. Comparing the two implants, you’ll notice the threads of the traditional implant are both longer and deeper. Without the additional length and depth, an all-on-4 screw has a greater chance of becoming loose, causing the treatment to fail. If you’re in need of dental implants, you may call our office to schedule an appointment or click here to request an appointment online. Dr. Burba will go over your case and help determine the best treatment option for you.